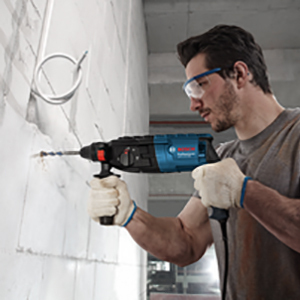 A professional hammer drill that is ideal for overhead drilling tasks where you need a powerful yet lightweight machine. 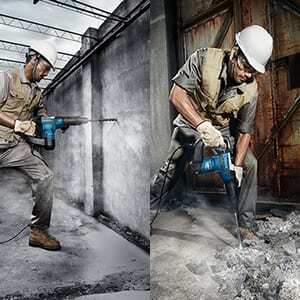 The rotary hammer drill is intended for hammer drilling in concrete, brick and stone. Turn the bottom part of the auxiliary handle in counter clockwise direction and swivel the auxiliary handle to the desired position. Then retighten the bottom part of the auxiliary handle by turning in clockwise direction. Pay attention that the clamping band of the auxiliary handle is positioned in the groove on the housing as intended for. 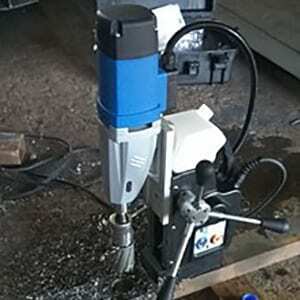 The required drilling depth can be set with the depth stop. Press the button for the depth stop adjustment and insert the depth stop into the auxiliary handle. The knurled surface of the depth stop must face downward. Insert the SDS-plus drilling tool to the stop into the SDS-plus tool holder. Otherwise, the movability of the SDS-plus drilling tool can lead to incorrect adjustment of the drilling depth. Pull out the depth stop until the distance between the tip of the drill bit and the tip of the depth stop corresponds with the desired drilling depth. 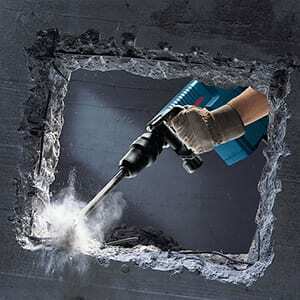 The dust protection cap largely prevents the entry of drilling dust into the tool holder during operation. When inserting the tool, take care that the dust protection cap is not damaged. If damaged return the tool to your nearest BuildEquip Branch so that the dust protection cap can be changed immediately. The SDS-plus drill chuck allows for simple and convenient changing of drilling tools without the use of additional tools. Clean and lightly grease the shank end of the tool. Insert the tool in a twisting manner into the tool holder until it latches itself. Check the latching by pulling the tool. 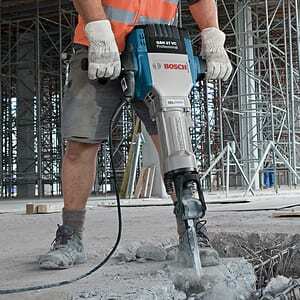 As a requirement of the system, the SDS-plus drilling tool can move freely. This causes a certain radial run-out at no-load, which has no effect on the accuracy of the drill hole, as the drill bit centres itself upon drilling. Push back the locking sleeve and remove the tool. 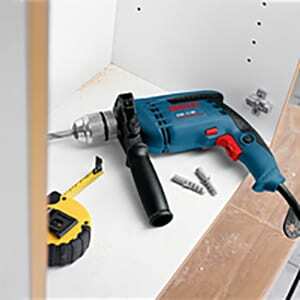 The operating mode of the power tool is selected with the mode selector switch. To change the operating mode, push the release button and turn the mode selector switch to the requested position until it can be heard to latch. The rotational direction switch is used to reverse the rotational direction of the machine. However, this is not possible with the On/Off switch actuated. Right rotation: Turn the selector switch clockwise for drilling/hammer drilling on both sides to the stop in the position. Left rotation: Turn the selector switch anti-clockwise for drilling/hammer drilling on both sides to the stop in the position. Set the direction of rotation for hammer drilling always to right rotation. To start the machine, press the On/Off switch. To lock the On/Off switch, keep it pressed and additionally push the lock-on button. To switch off the machine, release the On/Off switch. When the On/Off switch is locked, press it first and then release it. To save energy, only switch the power tool on when using it. The speed/impact rate of the switched on power tool can be variably adjusted, depending on how far the On/Off switch is pressed. Light pressure on the On/Off switch results in low speed/ impact rate. Further pressure on the switch increases the speed/impact rate.